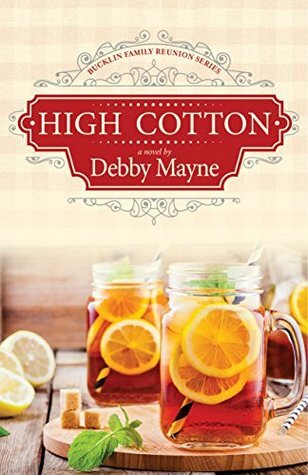 High Cotton is a southern novel set in the small town of Pinewood, Mississippi. Shay Henke is at the heart of the novel. She receives an invitation to a family reunion at the same time that she reconnects with her high school crush. And then there is a lot of family drama, especially from a secret her sister-in-law asks her to help keep and her younger twin cousins, who seek her advice. This is the first book in the Bucklin Family Reunion Series. This was a really enjoyable read! The author, who has clearly spent a lot of time in the south, captured small town southern life perfectly. I am a native southerner and loved that aspect of this book -- the southernisms of the language, the pacing, the food, the family dynamics. The book is told in alternating chapters by different members of the family. At first I was a little wary of this, because it really seems to be Shay's story at heart, but as the novel went on I really got to know the other characters (Missy, Punkin, and Sally) as well and cared about them. I enjoyed their storylines and seeing the way all the stories fit together. The dialogue was particularly strong in this novel. I could just visualize scenes, like a movie, because it was so engaging and well written. I recommend High Cotton for fans of Southern fiction, women's fiction, and Christian novels. I am already looking forward to reading the next book in the series! I received a copy of this book from Gilead Reviewers.